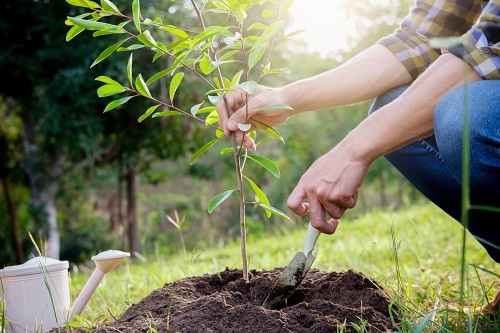 5 Signs Your Newly Planted Tree Needs More Attention | Mr. Tree, Inc.
A newly planted tree needs extra care and attention. If something is wrong, however, it is important to know what the problem is in order to address it quickly and avoid further damage to the new plant. The following are some of the more common problems many new trees face and the corresponding signs of these preventable and fixable issues. If the problem is not easily identified, calling up a tree service in Portland is the best way to ensure that the new addition to your yard survives. A younger tree generally requires more frequent watering than a mature tree because its root system isn’t established and so it uses more energy. In the first couple years of the tree’s life, it isn’t uncommon to water twice a week. Since roots grow deep, trees prefer a deep watering less often versus watering frequently and only wetting the surface of the soil. That is why drip systems are the preferred method in the industry because, unlike a hose, it allows water to slowly trickle down into the soil and reach deep into the roots. To determine if the plant needs more water, dig in the soil with a screwdriver to feel how moist the earth is. If it’s dry, then it’s time to water; if it feels damp, hold off on watering for a couple of days. Another factor when determining how much water a tree may need is the climate where it is going to be planted. Those who live in an arid climate should consider planting trees with drought tolerance because the tree is more likely to succeed and it will require less maintenance. Additionally, mulch is a tree’s best friend; it helps retain moisture and prevents invasive plants from taking over. Overwatering a tree is just as damaging as not watering it at all. Since symptoms of overwatering can be easily confused for a lack of watering, it is important to know the difference. If the tree shows signs of yellow leaves on the lower branches or at the inside of the canopy, or brittle green leaves, it may be a sign of overwatering, which can also lead to root rot or fungus. While a newly planted tree needs to get the correct amount of watering, mature trees are best left to nature. After the first two years, a tree will be able to withstand a wider range of water conditions on its own because it has a proper root structure. If the health of a tree is in question it’s always a great idea to consult with a tree service in Portland that can provide more information about the tree’s health. The symptoms of stress often develop slowly, more slowly than insect or disease symptoms. Some things to look for include: the appearance of abnormally small leaves, pale green coloration of leaves, unusually slow growth, premature development of fall leaf coloration, early leaf drop, dieback of twigs and branches, wilting of leaves and tender new growth, peeling bark, and presence of fungi protruding from stems and branches. The repeated occurrence of these symptoms over a period of years is a good indicator that a tree is subject to some chronic stress influences. Perhaps nothing is more important at preventing stress than proper tree planting. Research has shown that a tree planted at the correct depth, in a hole of sufficient size to accommodate the tree’s expanding root system, has a much greater chance of survival than an improperly planted one. Most trees are able to withstand a certain amount of insect infestation. It is when pest populations build to very high levels that problems occur. Unfortunately, pests are not usually noticed until they are in abundance. Therefore, a program of regular and methodical inspection of trees should be implemented, especially during the spring. Tree inspection should include an examination of bark, stems, and leaves for any signs of pests or abnormal appearance of the plant’s structure. There are many options for controlling insect pests on trees, including many measures that do not rely on the application of chemical pesticides. When dealing with small trees, pest control materials may be applied by the homeowner. A local garden supply dealer may be consulted regarding the appropriate materials to use. With large trees, specialized equipment will be needed to make applications of control materials. In such cases, it may be practical to hire an arborist who is licensed and certified to apply pesticides. Fertilizer application to trees should only be made if tree leaves are showing symptoms of nutrient deficiency, such as abnormally pale leaf color or abnormally small leaves. Other symptoms of nutrient deficiency include shorter than normal annual twig growth and tip dieback of branches. Be aware that these same symptoms may be the result of stress factors other than a lack of nutrients. Always evaluate the tree and nearby area for other possible explanations of decline. If fertilizer is to be applied, use one with an N-P-K ratio of 3-1-2 or 4-1-2. Fertilizer with an analysis such as 24-8-16, 12-4-4, 18-6-12, or similar formulas would be a good choice. Products designed for application to lawns are satisfactory, but avoid those containing weed killers. Fertilizers containing a high proportion of the nitrogen in a slow-release or water-insoluble form should be used. With so many factors standing in the way of the survival of a newly planted tree, it is important to know the variety of factors that can affect its growth. If, after looking for the aforementioned signs that the new tree is in need of attention, it is still unclear what steps should be taken, consulting a tree service in Portland will likely provide the insight needed to help the tree survive.